Anyone who has been reading my blog for a while will know just how much of a foundation junkie I am. I own around 30 plus foundations... yes it is alot. The one that has always been on my wishlist is the Giorgio Armani Luminous Silk Foundation. I have seen it mentioned in so many YouTube video's but I wasn't sure if it would work for my skin type as I have oily/combination skin. When I recently received this in a PR package I literally was super happy and excited. The packaging is stunning, I find some high end foundations can look a little cheap with certain packaging but Giorgio Armani have got this perfect. 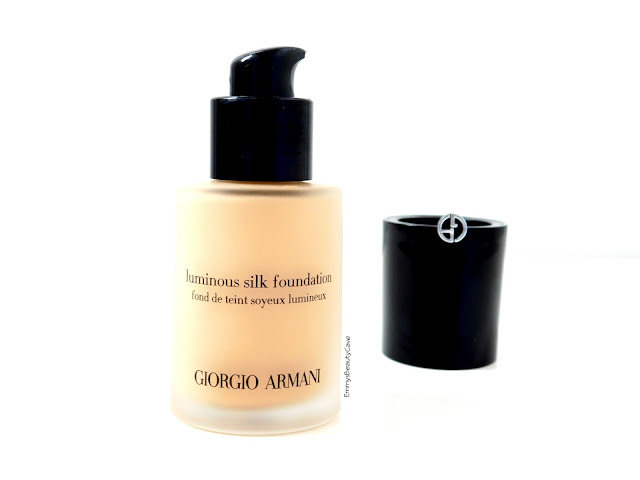 It comes in a glass bottle that is very sleek and then has the small Giorgio Armani logo on the lid. It also comes with a pump! All high end foundations should come with a pump, I don't understand why they don't all do it. This foundation comes in 21 shades which I think is incredible. It ranges from pale ivory for paler skin tones all the way up to darker skin tones so there is a shade to suit everyone. I applied one pump all over my face and blended half with my flat top kabuki brush and the other half with my beauty blender. I found I got a higher/fuller coverage using the brush as the beauty blender sheered it out. I find this foundation is medium coverage but can be built up. I just apply a little extra around my chin and the coverage is flawless. As I have oily skin I have always been put off by the "luminous" factor of this foundation. When I looked in the mirror I was amazed at how healthy my skin looked. It gave amazing coverage, covering up any redness I have but it still looked and felt natural on my skin. It does have a slight luminous finish but it isn't dewy like other foundations, it still has a slightly semi matte finish. I applied my powder as normal and loved the results. I have tested this out on numerous occasions and I am totally and utterly shocked by the results. I have had this foundation on for over 7-9 hours before checking in the mirror. I literally had the smallest amount of oil in the corners of my nose but hardly noticeable. I usually touch up with powder once in the afternoon but I don't have to with this foundation. All this time I have been worried it wouldn't work with oily/combination skin and I was completely wrong. I found it didn't cling to my small dry patches on my cheeks so I can really see why this foundation works for dry-oily skin types. Overall it has become one of my holy grail foundations. It retails for £37.00 which is the average price for a high end foundation. 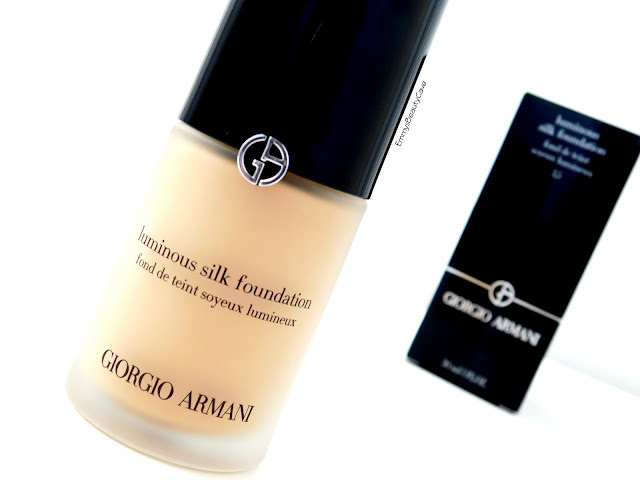 You can buy the Giorgio Armani Foundation from The House of Fraser online and in store. I can 100% say this is a foundation I will buy again as soon as this one runs out!